Eye: A copper and amber hue. Nose: This bouquet takes a moment to arrive, but when it does you will experience the sweet, festive flavors of ginger cookie, fig bread, anise, praline and vanilla. Palate: It is spicy and full bodied; fruity but dry. You will taste a tang of dried citrus, with a return of sweet, biscuit flavors and a hint of white pepper. The end notes are made up of walnut and black pepper, with a long, warming fade. 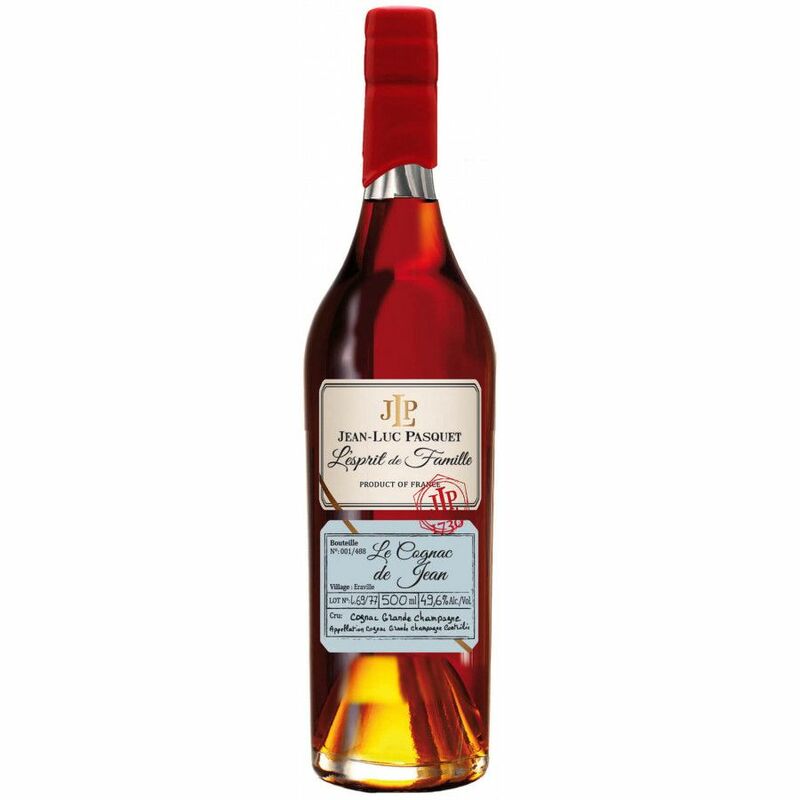 The Pasquet “L’esprit de famille” Jean is a Grande Champagne Cognac blend of 1969 and 1977 eaux-de-vie from Jean Blais, who was a fellow vintner and distiller, as well as neighbor of the Pasquet estate. The producers therefore hold this Cognac close to their heart. The bottling brings the two families together, and is a fine tribute to their friend and neighbor. The tale does not end there. Both families also come from outside of Eraville, and Jean took Jean-Luc under his wing, to share his ancestral secrets. Since then, Jean-Luc went on to assist Clairette in the cellars, and as a result blended these two vintages with her. This is a Cognac with plenty of character, from the Ugni Blanc grapes to the eaux-de-vie - and is a fantastic tribute to the man who crafted it. The Pasquet Jean arrives in a slim, classic bottle with a ruby red seal. The baby blue labeling denotes the artisanal craft of this house. It is created in tandem with the Pasquet Bernadette Cognac which was also made as a tribute to a close family friend.